Hi there! 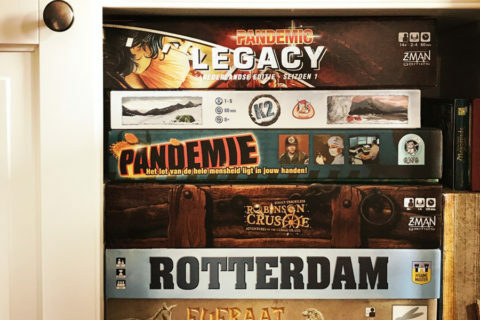 I am Wouter, a game designer from The Netherlands. I started designing board and card games in 2013. 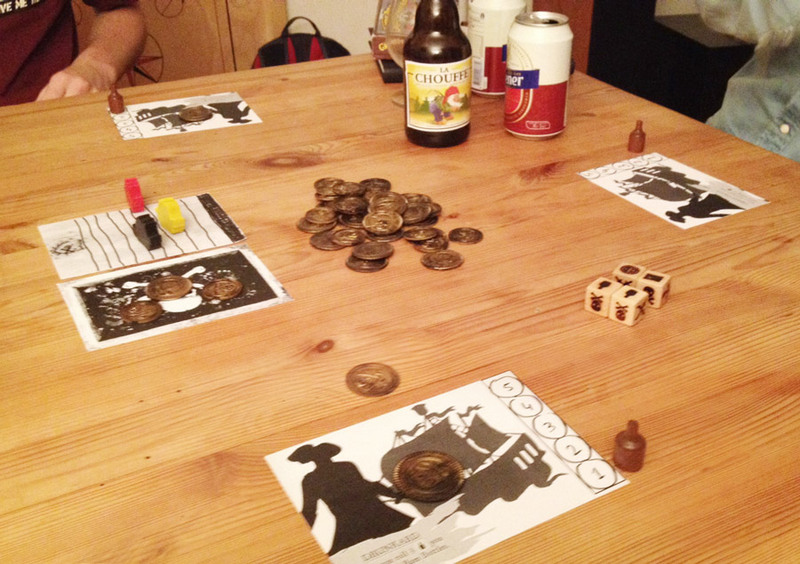 In 2014, Fully Analog published my first game: Greedy Pirates. Since then I’ve designed two other games, one of which has recently been published as well: Wacky Pirates. My third game will be launched later this year. I really love small indie tabletop projects, and I’d like to share this love with you by showing you how my two pirate games came about. 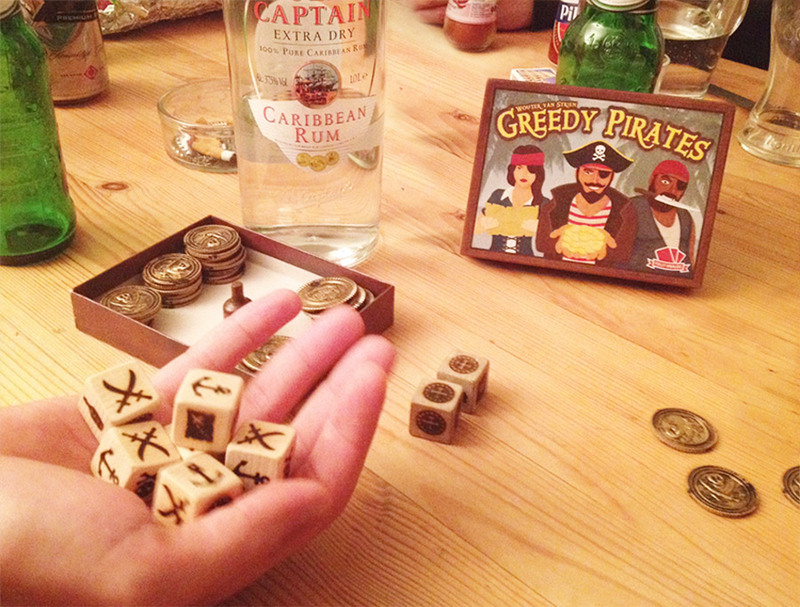 Playing Greedy Pirates while having a beer with friends. 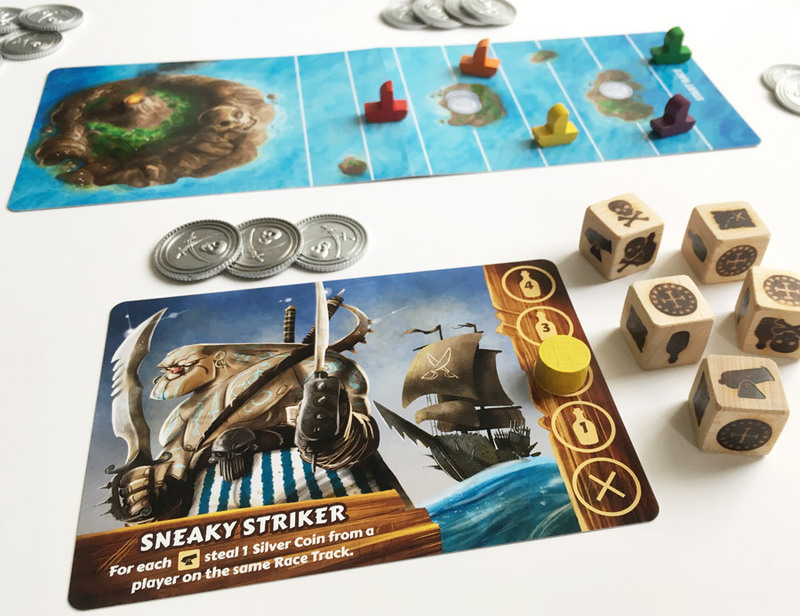 My first game, Greedy Pirates, is a quick press-your-luck style game with custom made wooden dice. It’s based on a dice-rolling mechanic similar to Yahtzee. 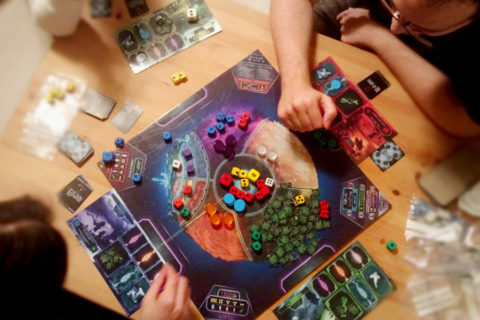 The idea for this game came after I played Roll Through the Ages by Matt Leacock. I love the wooden dice in that game and immediately thought of a pirate theme to complement them. After a friend of mine built a CNC milling machine I couldn’t wait to realize my dream: to make my first pirate-themed dice game! 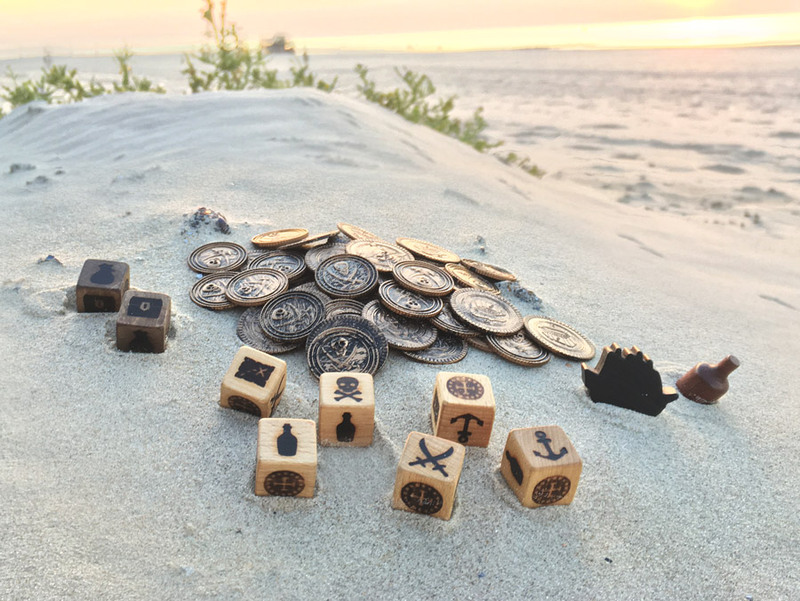 Playing Greedy Pirates on a windy beach. After Greedy Pirates I wanted to make a tabletop game with a central game board, while sticking to the pirate theme and custom made wooden dice. My first idea was to add a side quest to the game, where players sail to a treasure island to score a pile of gold. This worked quite well, adding a bit more depth to the original breezy game. Ultimately the side quest evolved into a full-fledged game in itself: Wacky Pirates. Playtesting one of the first prototypes of Wacky Pirates. 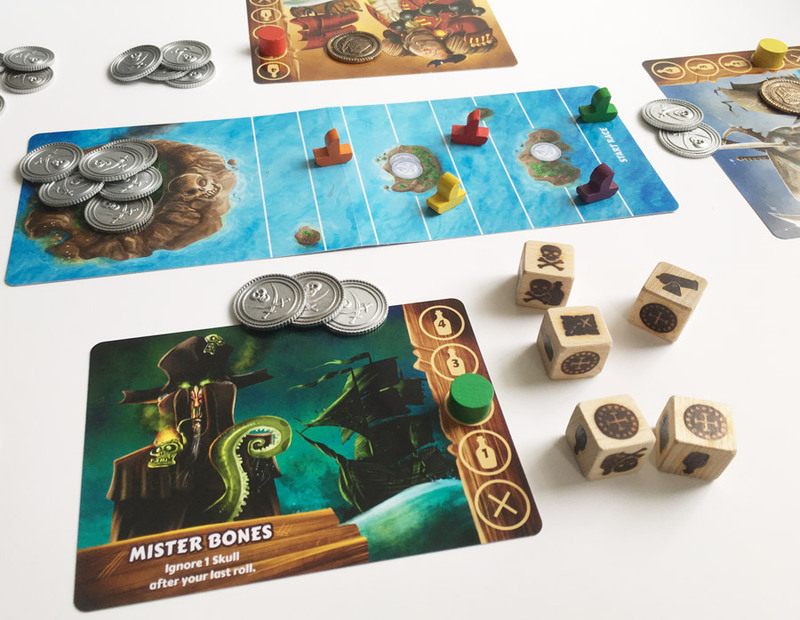 In Wacky Pirates each player is a Wacky Pirate racing to the cursed Skull Island in search of a big treasure. The prototype already featured the key element of this game: the excitement of racing to a big pile of gold! In the beginning of the game there is not much gold on the treasure island. But during the game the stack of gold grows and players have to sail fast to make it to the island in time to loot it. First sketches by The Mico. When I saw the game Valeria: Card Kingdoms by Isaias Vallejo I instantly fell in love with its artwork by Macedonian artist The Mico. I really wanted him to do the artwork for Wacky Pirates and I’m happy that he decided to come on board. When I saw his first awesome sketches of the characters I knew I chose the right man! Do you have what it takes to become the richest Wacky Pirate? And that’s in a nutshell how my last two games were developed through the years. Yes, I know, my games are quite hard to find. To keep the project low-cost my games are only produced in a very limited edition of 500 numbered (and signed) copies. If you’re interested in supporting my projects, there are still some copies for sale over here. 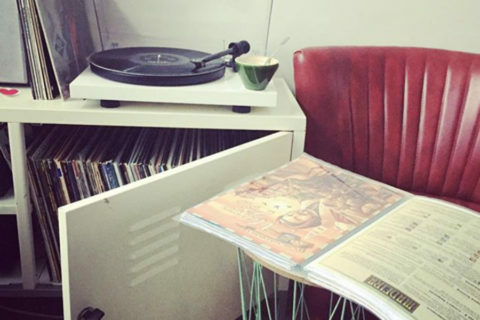 Thanks for reading my story and happy gaming! This game is really awesome! Easy to play, quick and surprising rounds and a friendly competitive twist, I love it.